After years of feeding Red Bellied Woodpeckers in my back yard, I finally have a pair that are calling a nearly dead tree just over my back fence home! Since shortly after I put up my first peanut feeder and suet I’ve had them around and about my yard. I’ve always loved listening to their vocalizations that sound like they mean business. I’ve always wondered where they were nesting since they seemed to be very close all year round. Now, I’ll know for sure. My wife was the first one to notice the tapping sound. Since I have many types of woodpeckers around and a LOT of wood, it can be very hard to isolate any sound. We even have a tall tree back in the woods behind my property that every woodpecker from Downy to Pileated has used for drumming. It must have the perfect combination of height, density and circumference. You can always tell which woodpecker is using it by the pitch it makes. Very cool! I walked to the back of the property and looked up at the tree she mentioned. I could hear muffled tapping but it was very hard to discern exactly where it was coming from. After a few minutes, I just gave up and went back to work. 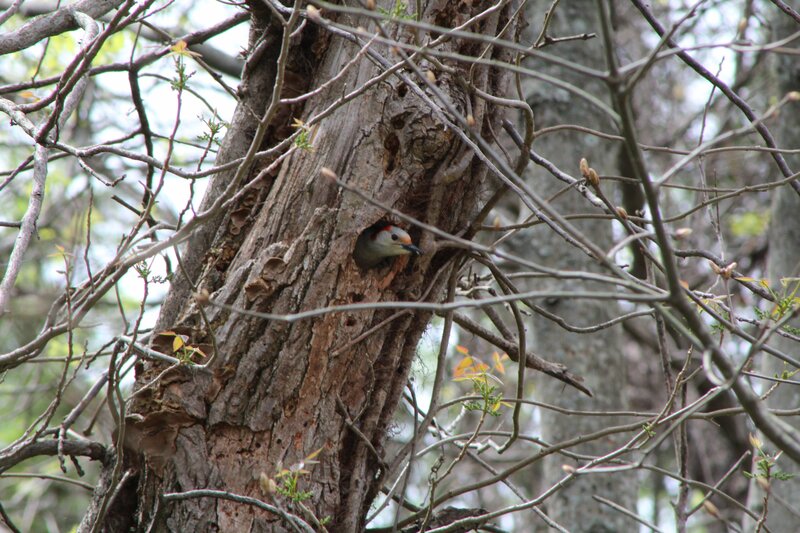 A couple of days later, I noticed the male was perching on the side of a tree near where I heard the tapping. I walked back there again being careful not to spook him. That’s when I saw her sticking her head out! She looked around a little and then went back inside. I knew then I was looking at a future woodpecker nest. 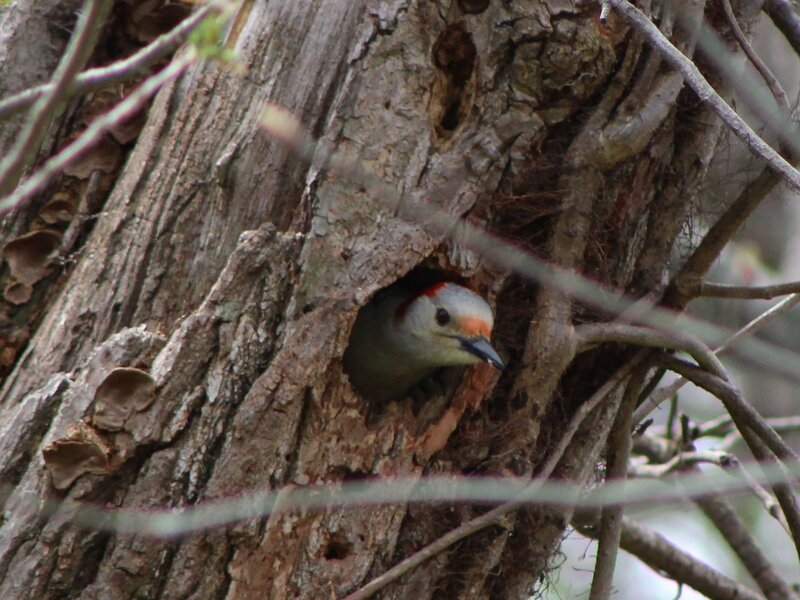 The strangest thing about this is if I had seen the hole before now I would NEVER have thought it was big enough for a Red Bellied Woodpecker. I know they do a LOT of excavation inside but I wouldn’t have thought the hole was nearly big enough for either of them. Subsequent viewing proved me dead wrong. A day or two ago, I decided I was going to go back there and just wait for her to go in or come out. I was determined to get a shot of her in there working. I knew if she was around, preservation DNA would keep her from entering while a potential predator watched. Still, I wanted the shot and took my chances. I didn’t have to wait long. After about a minute, I heard the same tapping resuming. In a couple more minutes, she stuck her head out. I took a few quick pics and I’m posting them here for your enjoyment. I’ll try to keep up with them and see if I might be able to get a shot of the youngsters fledging when they do. I’ll have to review the nestling to fledgling stats and see if I can make a decent prediction about when to expect them. I’ll keep you posted. 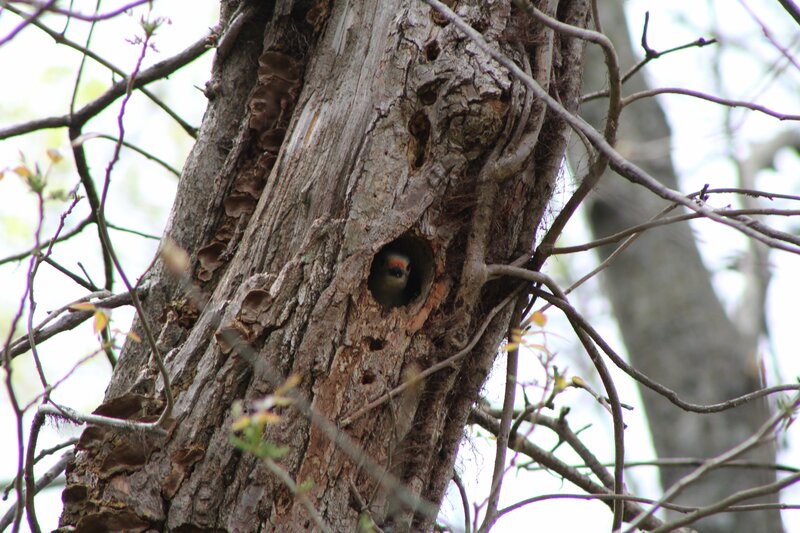 Have you had a pair of Red Bellied Woodpeckers nest close enough for you to watch them? Leave me a comment below and tell me how it went. Also, if you’ve enjoyed this post please share it on your favorite social media site using the buttons below.